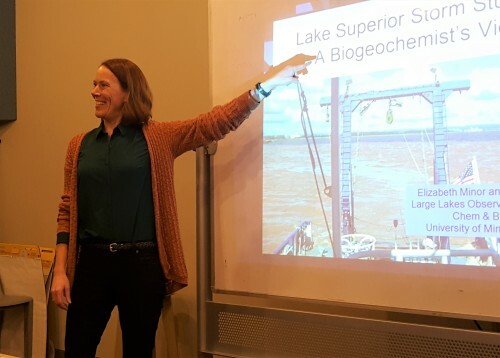 Elizabeth Minor, a professor with the University of Minnesota Duluth’s Large Lakes Observatory and Department of Chemistry, described her research on the impact of sediment plumes on the St. Louis River and Lake Superior for the River Talk on Nov. 14. “It’s a pretty impactful thing,” Minor said. Excess dirt (sediment), water and nutrient runoff cause the river and lake to turn into the color of chocolate milk and can cause other effects in the ecosystem. Minor’s work as a biogeochemist allows her to use the university’s research vessel, the Blue Heron, to gather research samples. Minor has been doing this since the 2012 flood in Superior, Wisconsin, and Duluth, Minnesota, to see how sediment plumes change before and after such mega-events. According to her, there have been 15 extreme rain events in the past 152 years in Minnesota. These events change Lake Superior by adding new material to the water. Minor’s research on the plumes focuses especially on phytoplankton and algae, which need three things to sufficiently grow and thrive. These are light, appropriate temperatures and appropriate nutrients: nitrogen, phosphorus and iron. Minor found that mega-storms can deliver a lot of nutrients to the lake, including seven to 44 percent of the whole lake’s annual phosphorus input from the 2012 storm. The Blue Heron has a sensor (called a transmissometer) that goes into the water and shines red light across a known path length at whatever depth it is placed. Based on the amount of light this sensor detects, Minor and her fellow researchers are able to know just how much sediment is blocking the light at a given depth in the water. Minor and her research team also collect water samples to see what materials are in the lake. Minor said that while we cannot change how mega-events like the 2012 and 2016 storms affect the lake, we can work on watching and minimizing our carbon footprint. People can also work to reduce erosion and to keep storm drains clear so the water from storms goes where it’s supposed to and doesn’t make its own way to the lake. “There are a lot of questions about what happens in the lake, but unfortunately there are not a lot of us scientists,” she said. After a break for the holidays in December, the next talk will take place on Jan. 9, 2019, at 7 p.m. It will feature a panel discussion about watersheds and urban streams. This entry was tagged Elizabeth Minor, flooding, sediment plumes, Superior. Bookmark the permalink.